Winter 2018...competitors wipe sweat from their brows and stretch to limber up for the intense display of skill and training to come. No, this isn’t the Winter Olympics (although similarly anticipated and televised)...it’s the CREMA Tenth Anniversary Latte Art Throwdown and tensions are high as baristas wonder if hours of daily milk steaming will prove to be enough preparation to prevail against other equally-practiced baristas from the city. What makes this throwdown different than the others is that the event is not just centered around competition, but also around celebration. Cold beer provided by Bearded Iris Brewing is flowing, our favorite DJ/barista Abby Wright (under her alias "Because Shutup") is spinning the perfect tunes and Califarmia has warmed bellies and hearts alike with their tacos, ramen & guacamole. Proceeds from the $5 buy-in go to Safe Haven Family Shelter and there are prizes to be won ranging from a year-long subscription to Barista Magazine to a bag of CREMA coffee beans. We are all here to celebrate Ten Together - ten years of CREMA being a part of the Nashville coffee community, a milestone we never could have reached without the same awesome people who are in attendance this very night (and many others). Onlookers are excitedly engaged as the competition begins and forty competitors are slowly whittled down to twenty...and then ten...all trusting in the roll of a dice that will determine what to pour and into what kind of vessel. Will it be a swan in a 2-ounce cup? A double rosetta in a funky cup? (Don’t worry, we didn’t know what a funky cup was until now either...imagine a plastic pink martini glass with a black fuzzy boa around the handle and you’ll end up somewhere close) Nothing challenges a barista’s innate pouring abilities like taking their go-to’s and safety-pours and throwing them out the window. Not surprisingly, everyone handled the unexpected twists & turns like champions and nothing could stand in the way as it came down to our final two - Geo from Fido and Sean...also from Fido (way to represent, Fido!). The scent of steamed milk hangs in the air and the theme from Chariots of Fire sets the very non-dramatic tone as the final pours are made into a small, sparkly plastic cowboy hat. Sean takes the cake and then we eat the cake (from Sweet 16th Bakery to celebrate our anniversary, of course). 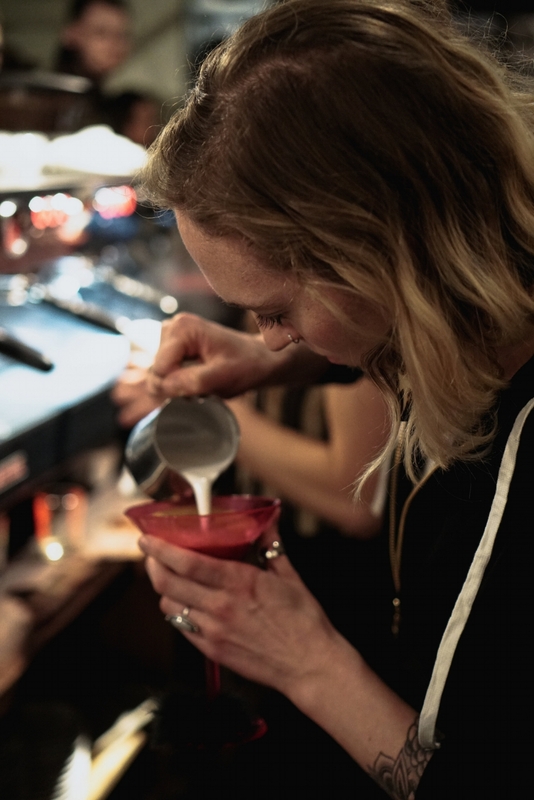 At the end of the night with competitive natures set aside, the focus remains set on enjoying the richness of Nashville’s coffee community and the gift of being part of said community for the past ten years. Here’s to the next ten being even better than the last!